Nature versus nurture? Are villains born or bred? Can they ever find true redemption? Theater OCU explores Shakespeare's most villainous characters – Macbeth, Iago, Aaron, Tamora and Lady Macbeth – and asks the question: what is bad Shakespeare? 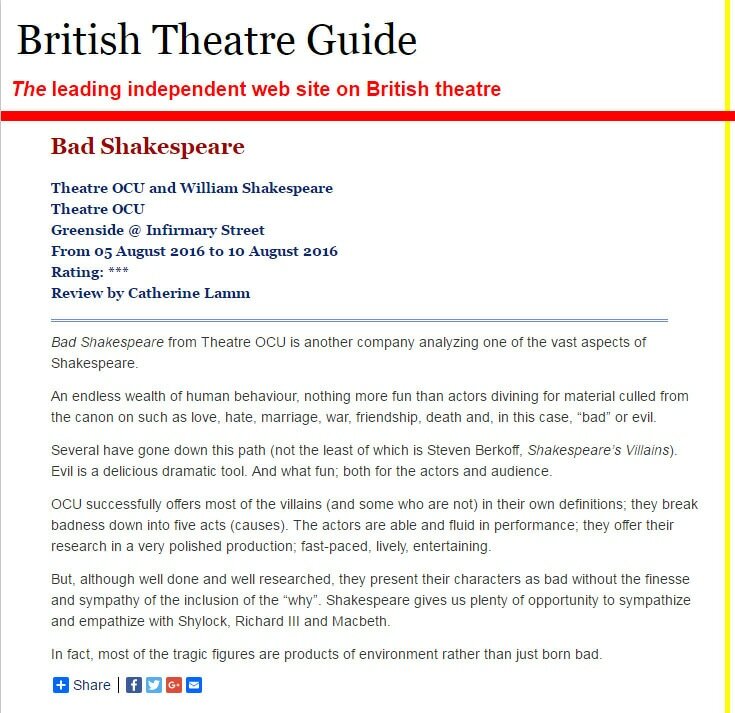 by Fiona Russell on 10th August 2016Something of a misnomer, Bad Shakespeare does not reflect the quality of the acting or of the performance. 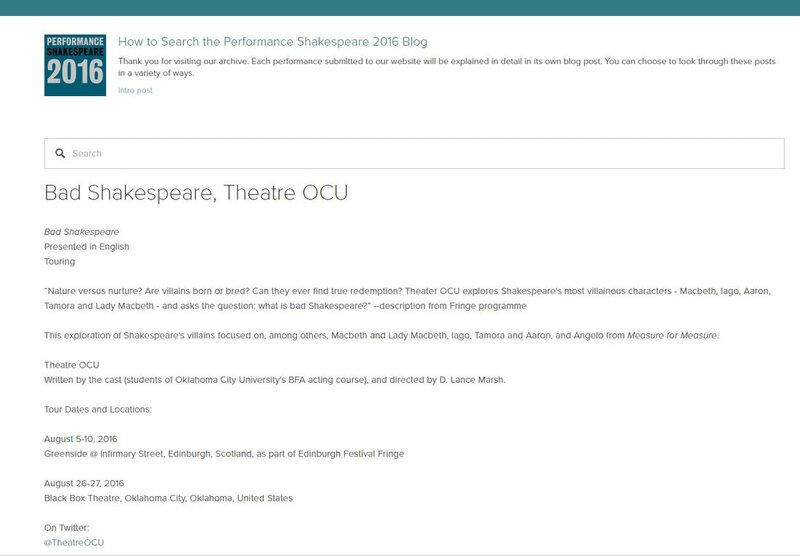 Instead, it explores and illustrates different aspects of the playwright’s villains from a number of plays and a variety of angles, showcasing the critical and performative talent of the group from the BFA Acting company at Oklahoma City University, under the direction of D. Lance Marsh. Smartly accoutered in fantastically villainous period outfits, the group present an hour-long show that illustrates, through the medium of a lecture or verbal-essay with a twist, some of the greatest villains ever invented, delving into the complexities of these characters. The show is laid out in five parts, or ‘acts’, each of which examining a particular aspect before drawing to an unsettling conclusion. 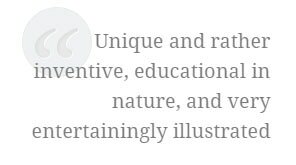 The concept is unique and rather inventive, educational in nature, and very entertainingly illustrated with a real clarity and sense of purpose throughout. For people with an existing knowledge of Shakespeare and with an interest in the academic study of the Bard, this show might be of interest. There are well-known villains, including Lady Macbeth and Iago, in addition to less household names, including Aaron the Moor and Tamora (Kally Duncan) from the gut-wrenching bloodbath of a play, Titus Andronicus, and the self-righteous Angelo (Franciscan Harms, Haileigh Tomlinson and Gage Rancich) from Measure for Measure. Some of the monologues presented were particularly blood chilling, with an intensity and commitment admirable in such young actors. Particularly outstanding performances came from Keziah Williamson, who had a remarkable stage presence as Macbeth and Tyra Bullock as Aaron, whose speech had the audience holding their breath at the calm yet intense and gripping delivery. Some of the speeches could have gone slightly further in enhancing the believability of the scenario, perhaps by using a little more physicality, but the majority of the performances were very strong and engaging, with clear character development and thought. Furthermore, the performers pointed out particular aspects to watch out for, and linked the sections in a mellifluous and entertaining way, maintaining audience attention throughout and providing some variety and light-relief to the subject matter. Bad Shakespeare is a fantastic way of whetting the critical faculties and engaging with the darker aspect of the world’s most performed playwright, with the help of an extremely talented group of students who handle the material very proficiently in a fresh and chillingly captivating manner. ​By Fiona Russell @fionaerussellIn addition to reviewing, performing and creating theatre at university, Fiona enjoys reading, languages, performing and discussing Shakespeare, classical music, skiing and feigning competency in the kitchen. In fact, most of the tragic figures are products of environment rather than just born bad. 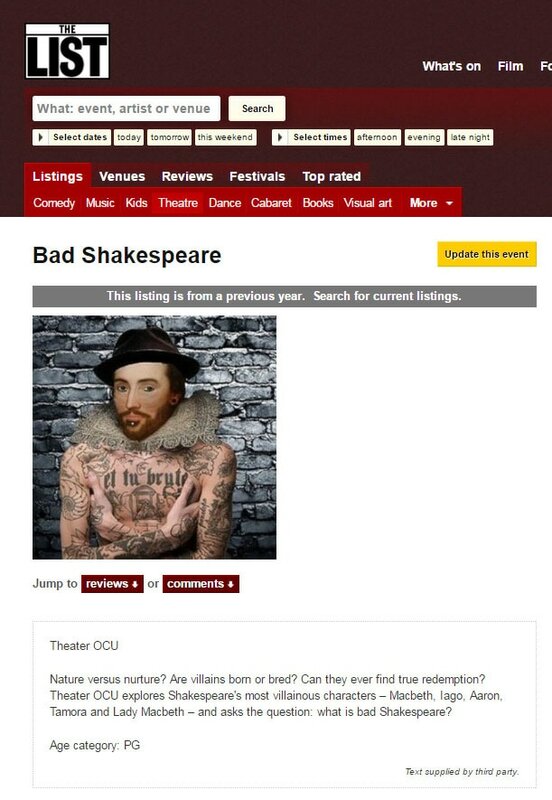 TheatreOCU's BAD SHAKESPEARE preparing for the Fringe Festival in Edinburgh!